Create a grid that is approximately 10X25 yards. Randomly scatter flags within the grid. To begin the drill, add two fewer flags than the number of players you have. Each player should begin inside the grid with a ball. Instruct the players to dribble around freely inside the grid avoiding other players and flags. The congestion of the players and flags will cause the player to look up to check their surroundings continually. When the coach yells "STOP," each of the players must race to a free flag as quickly as possible. 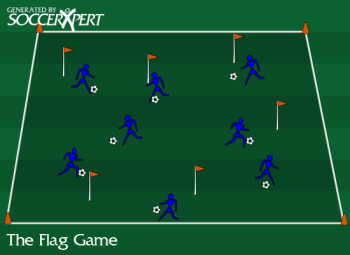 The first player to reach the flag five consecutive times wins the game. Reduce the number of flags. Instead of keeping score, make the players do some minor form of punishment like push-ups, star-jumps, sit-ups. Make sure the action is age appropriate. Restrict the players to only use a certain part of the foot or dribbling technique. Make sure the player is regularly lifting their head and checking their surroundings; this will help players find space and avoid other players. Make sure players keep the ball close to them while in congested areas; this will help them move the ball more quickly to avoid other players and obstructions. Encourage players to use all parts of their feet while dribbling (inside, outside, top, bottom).